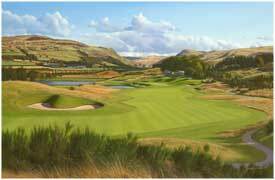 , the painting depicts the stunning 2nd hole on the PGA Centenary Course at Gleneagles. is the official artist to some of the world's most iconic golf tournaments such as The Ryder Cup and The Open Championship; and his work is proudly displayed in some of the world's most famous clubhouses, including St Andrews, Augusta and Pebble Beach. , Ryder Cup Director Richard Hills and Managing Director of The Gleneagles Hotel Patrick Elsmie for the unveiling at an event at The Medinah Country Club, where the 2012 event is taking place this week. The painting wasn't the only celebration of Scotland during the evening with the menu designed by Gleneagles executive chef Alan Gibb, Scottish produce sourced by Scottish Development International and music performed by Julie Fowlis. "It is also a thrill as Gleneagles is not only one of the most beautiful courses in the world, but that is where I played my golf for more than 20years. I have been fortunate over the years to get the chance to paint and visit most of the greatest golf courses and clubs in the world, and I always get asked 'if you could only play golf on one of the great courses in the world for the rest of your life, which one would it be?' That is easy I respond. It would be Gleneagles." First Minister Alex Salmond said: "
has created a beautiful image of Scotland that will become familiar to millions around the world as they watch the Ryder Cup action unfold at Gleneagles in just two years' time. is known internationally for capturing on canvas some of the most famous golf courses in the world and there could be no better artist chosen to depict the Gleneagles course in all its glory ahead of the 2014 event." at Gleneagles. Graeme has long been recognised as one of the world's leading golf artists and it is fitting to have him capture the majesty of The PGA Centenary Course in such a way." Patrick Elsmie said "A feature of The PGA Centenary Course at Gleneagles is the feast of spectacular views you get of the countryside in which it is set. Graeme has captured this brilliantly on the second hole with Glendevon and the Ochil Hills as the backdrop to this great par five." are now available to purchase from www.CachetUK.com (UK) and www.GraemeBaxter.com (US). golf art is admired and prized internationally for its superb quality, depth of feeling and knowledge of the subject. is the official golf artist for the The Open Championship, Ryder Cup, PGA and PGA European Tour, Solheim Cup, Presidents Cup, World Championship. paintings hang in famous clubhouses as far afield as the Honourable Company of Edinburgh Golfers at Muirfield, St Andews Old Course, Scotland and Augusta National, home of the US Masters, Pine Valley China.